Being a Physical Therapist is a very rewarding career that makes you look forward to going to work every single day. It’s a specialized field where you can impact someone so much, that post-treatment, they can resume living their life again. You get to work with people one-on-one and watch them progress before your very eyes. Your treatments truly make a difference. Those are some of the benefits of being a physical therapist. As someone that has been practicing physical therapy for over 5 years now, I feel so lucky to have a career not just a job. I remember being in high school and having all the pressure to go to a good college and find a career. It all seemed so daunting at the age of 17. Luckily, I attended a proactive high school that supplied us with opportunities to be exposed to different careers. I saw a variety of occupations that seemed appealing but still wasn’t sure what I truly wanted to be when I grew up. I found out more about physical therapy and decided to attend graduate school. All of the schooling seemed overwhelming at first and can be a deterrent for many. After 7 years of school I was finally done and ready to get started on my career path as a Doctor of Physical Therapy! I began working in a private practice outpatient clinic. There, I enjoyed great mentoring and opportunities to build my skills as a therapist. I can’t say enough about how lucky I am to love my career and want to encourage students to look into a physical therapy career. When I recently attended a career fair at a local high school I felt compelled to share my joy for this career. I was sad that few kids came towards our booth or seemed apprehensive when told about the duration of schooling. There are so many benefits to becoming a therapist. In terms of employment opportunities, according to the Bureau of Labor Statistics “employment of physical therapists is expected to grow by 36 percent from 2012 to 2022, much faster than the average for all occupations. While demand for physical therapists varies by geographical region and area of practice, the unemployment rates are low across the country. 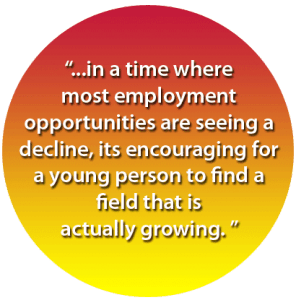 The need for physical therapists is expected to remain strong into the foreseeable future.” So in a time where most employment opportunities are seeing a decline its encouraging for a young person to find a field that is actually growing. At the career fair I wanted to have a serious discussion with the kids to find a true path and be realistic with them. I wanted to explain to them that it’s important to do something that they love but they need to make sure that they choose a major in college that will lead them into a job when they are finished school. College is a very expensive endeavor and in order to pay off loan debt it is critical that students find something that will create opportunities. In my opinion physical therapy fits that description to a tee. Graston Technique™ therapy being used on patient.I think there is often a misconception of what physical therapists actually do. We don’t just put a hot pack on patient then give them a massage and then let them walk out the door. We are trained to treat a variety of conditions and work in a variety of settings. Therapists can work in hospitals, private practices, home health agencies, sports and fitness facilities, nursing homes, schools, and outpatient clinics. Since school I’ve been trained in dry needling, spinal manipulation, and the Graston Technique™. All of my days are similar but drastically different keeping me constantly on my toes. I see and treat a variety of conditions throughout the day. I can start my day with a 10 year old child with knee pain, then a 90 year old that has a history of falls and we work on balance, and end my day with a patient suffering from chronic headaches and I perform dry needling and cervical spine adjustments. The amount of variety makes the days and weeks fly by. I’ve found that over the years I still love my job. I don’t dread going to work every day and I’m not stuck behind a desk pushing papers. Job satisfaction is felt throughout the profession. “Physical therapist report one of the highest job-satisfaction levels in the country. Forbes ranked physical therapists as having 1 of the ‘The Ten Happiest Jobs’, according to articles published in 2013 and 2011. CNNMoney.com gave physical therapists a grade of ‘A’ in Personal Satisfaction in 2012, as well as in its ‘Benefit to Society’ categories. A National Opinion Research Center survey, which was chronicled in an April 17, 2007, article of the Chicago Tribune. With more than three-quarters of physical therapists polled reporting to be ‘very satisfied’ with their occupations. PT’s were second only to clergy, and were the only health care professionals in the top 5.” I continue to encourage students to look at physical therapy as a career. At Hampton Physical Therapy we offer different shadowing and clinical experiences. Feel free to contact either our Hampton or Seabrook, NH clinics to arrange a job opportunity if your child is interested in learning more about being physical therapist.